Luxuriously silky shower oil transforms into a soft lather when in contact with water and cleans gently. 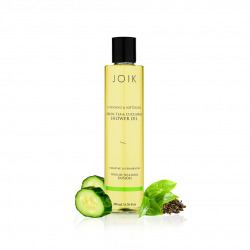 Shower oil is a wonderful alternative to typical shower gels. A sweet but fresh scent combines delicate elderflowers and juicy green apples. I use this as a shaving oil. It creates a nice foamy lather which is perfect for that purpose. The scent is divine, intense, and very long-lasting.